You Are Here: Home » Local News » DCA Jazz Ensemble – Live with Nat Adderly, Jr.
DCA Jazz Ensemble – Live with Nat Adderly, Jr.
BROWARD COUNTY, FL — The sweet sounds of jazz, rhythm and blues filled the evening at Dillard Center for the Arts recent celebration of the life and legacy of the late great saxophonist, Julian “Cannonball” Adderley. Brianna Garcon singing “I Ain’t Got Nothing But The Blues”. The event was hosted by the Old Dillard Museum & Dillard Center for the Arts in memoriam of Fort Lauderdale’s greatest band director. In his honor, his nephew Nat Adderley, Jr., a nationally renowned jazz pianist who once was the music director and arranger for Luther Vandross, joined the DCA Jazz Ensemble on stage to pay tribute. The event was originally scheduled in September, but due to Hurricane Irma it was postponed. That did not hinder the turnout of the event, as many of the parents, community, and fans filled the audience. Nadia Nicole Bailey singing “Teach Me Tonight”. Included in the audience was Jackie Powell, a candidate for Broward County Court Judge who said, “The talent on the stage is simply amazing, everything from the saxophonist to the singers”. 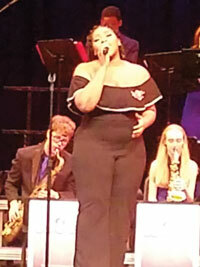 The talented and energized students performed musical selections from Duke Ellington and “Cannonball” Adderley. The singers who performed were Brianna Garcon singing “I Ain’t Got Nothing But the Blues”, and Nadia Nicole Bailey singing “Teach Me Tonight”. There were several solo performances by trumpeters, saxophonists, percussion, and trombonists that left the crowd in awe. Superintendent Runcie continued, “I am looking forward to when they go to New York for the Essentially Ellington Competition where they always excel. It is a testament that we have great talent and leader-ship at Dillard High School, under the direction of Mr. Christopher Dorsey”. Also in the audience was Principal of Dillard High, Casandra D. Robinson who stated, “It is such an honor and privilege to see the collaboration between Nat Adderley Jr and the DCA Jazz Ensemble. I am so proud to witness my students express their talents on stage. They are amazing and I am delighted to be the principal of this awesome school and staff”. Earlier this year, Christopher Dorsey was awarded an OIC Golden Record award for the preservation of jazz and Jazz Education. The school music program was once led by the legendary Cannonball Adderley between 1948 and 1956. Nat Adderley Jr. stated that when he realized most of Luther Vandross hits came from his compositions, he later took ownership of publishing rights and you can now see his credit as Dillard Music on recorded albums.